I have an evergreen hedge that runs the length of my property. It is beginning to grow too large. When and how should I prune it? Things really begin to pick up in the garden in late winter and early spring, so to stay ahead of the workload, it is a good idea to get as many of the big projects out of the way as soon as possible, like pruning evergreen hedges. The first thing you’ll want to do is start with a pair of sharp shears so that when you prune the plant you don’t leave any ragged edges on the stems. The great thing about pruning evergreens is that the more you prune them, the thicker they become. How you make the cut depends on whether the hedge is a broad-leafed evergreen like boxwood or a needle type evergreen, such as Leyland cypress. However, you never want to cut a needle type evergreen all the way back to the trunk or to a bare stem because they can’t recover. All of their dormant buds are in the green foliage. One of the reasons it is wise to prune this time of year is that it’s just before the plant flushes new growth, so you are helping the plant be more efficient with its energy. 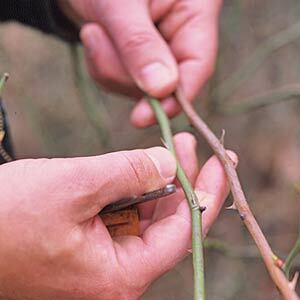 Now when pruning hedges, shear them on a slight bevel so that the bottom sticks out a little further than the top. Allowing the top to grow out too much shades out all of the light and causes the bottom of the hedge to become leggy. You can make the job easier by using a string and a line level as a guide to keep it even across the top. By shaping up your hedges and not let them get out of control, you’ll find it doesn’t take much time to keep them looking great. There is no plant quite as majestic as a tree. Not only do they provide some of the basic necessities such as clean air and shelter, the landscape would be barren without their green canopies and regal trunks. Trees also benefit homeowners by improving the energy efficiency of their homes. According to some studies, increasing the resale value of the property between 7 to 20 percent. So it just makes sense to take care of our trees. When it comes to mature trees not much maintenance is required, but if there are signs of trouble it is important to call in a certified arborist to diagnose a problem before it gets out of hand. Beyond a basic tree pruning service, a good arborist will be able to help you with tree pruning, preventive maintenance, diagnosis and treatment of diseases, insects, and general health issues. If you are thinking of adding trees to your garden, a certified arborist can help you with selection, planting and care. There are seven post oaks at the Garden Home Retreat that I call the "Seven Sisters" and they are the pride of the landscape. When I began the Garden Home Retreat project, one of my first tasks was finding a certified arborist to take a look at the Sisters. Finding an arborist is somewhat like selecting a new doctor. It’s always good to contact one with a solid reputation. During the Tour des Trees cycling event, I met a lot of arborists and they all recommended Mark Chisholm, a third generation arborist and tree climbing champion. Mark has won many competitions for tree climbing including the 2001 International Society of Arborculture International Tree Climbing Championship and the ISA New Jersey Chapter Tree Climbing Championship for fifteen years straight. This competitive streak combined with his skill and knowledge made him the ideal person to consult about the 7 post oaks growing at the Garden Home Retreat. So, Mark came out to the farm to show me the things I need to do to keep the Sisters strong and healthy. Here is an excerpt from our conversation where Mark discusses tree pruning and tree pruning safety. Allen: We are really excited about the work you are going to do here. Mark: Yes, I’m excited too. These trees are magnificent. Allen: We call them the Seven Sisters but I guess one of them should be designated as the big sister. Mark: I’d say the one right in the center. Allen: Yes, that one is in the epicenter of all the activity. Well, tell me what you think of these trees and what we need to do. Mark: Sure. First, we need to do a little hazard evaluation to make sure everyone is out of harm’s way. Allen: What are the first things you look for when evaluating a tree? Mark: Generally speaking I look for what is called the three "Ds" – dead, diseased and dying. Allen: What about getting to the actual cuts? There is a proper way to do things. Mark: When making a cut, there is a lot to consider depending on the size of the branch. If the branch is small, a pair of hand snips or a hand saw is a sufficient pruning tool. Make sure you have secure footing and make a clean cut. But when tackling larger limbs you have to think about a few things, especially when using a chain saw. You have to know about chainsaw safety. When making the cut, what I try to do is make a cut that will eliminate the branch without damaging the trunk tissue. So, I use what is called a 3 step-cut, which is basic on a large limb. Make an under cut slightly into the underside of the branch, stopping before it gets too deep. Then make a topping cut right above or slightly out from the under cut so that when the limb falls it will break cleanly from the tree. Allen: So, Mark is there a time when a homeowner should consider bringing in a professional tree pruning service? Mark: Yes, absolutely. It depends on a lot of things, to be honest with you. For example, the current positioning of the tree – if it is near power lines, a house, a roadway. A rule of thumb to follow is that if you haven’t tackled tree pruning yourself very often or you are just not feeling comfortable with the situation, call in a pro. Another reason to hire a tree pruning service is whenever you have to take your cutting or pruning practices above ground. This makes the project quite dangerous. As an arborist I don’t work without firm footing on the ground, a secure anchor to the tree or in a lift. Those are the only places where I feel comfortable and safe. Allen: I’m sure having the right tree pruning equipment is really important. Mark: Yes. I never work in a tree without having personal protective equipment, what we in the business call PPE. It starts with head protection, which is a helmet or hard hat depending on the job. As a climber I need to have a helmet on my head. This helmet is built for climbers because it has a chin strap so if I turn upside down it stays on and keeps protecting my head. The hard hat styles are made for working on the ground to deflect falling debris from felling and such. Allen: Very good. Well, I didn’t know the difference. Mark: You also need hearing protection. You can either go with an ear plug like I use or you can use the ear muff style hearing protection. And then there is eye protection, which of course is definitely a must have. Eye protection should be impact resistant and made for this type of work. And lastly, we have chain saw protection in the form of chain saw pants. You can also get leg protection in chaps. These protective pants or chaps are made of material that will actually stop the chain from moving once it comes in contact with the material. The material pulls out and stops the chain very quickly. Allen: I’ve seen that at work. It’s amazing and really clogs up the chain. Mark: It doesn’t protect you 100 percent from getting a cut, but these pants greatly reduce the risk of having a major injury.